The Xcite™ system provides a superior and efficient alternative to all prior HTDEM technologies for the minerals exploration and geoscience mapping community. 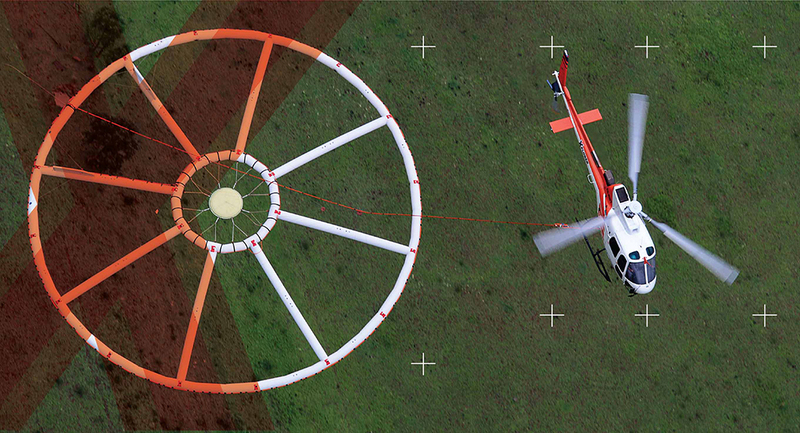 Xcite™ is a new generation of helicopter-borne time-domain electromagnetic (HTDEM) systems, developed by New Resolution Geophysics (NRG™). By incorporating the latest new-age, high speed electronics and sophisticated aeronautical engineering, New Resolution Geophysics (NRG™) has developed the next generation HTDEM system. The Xcite™ system provides a superior and efficient alternative to all prior HTDEM technologies for the minerals exploration and geoscience mapping community. A patented inflatable bird has been developed as a carrier for the system. The transmitter loop diameter is approximately 20 metres resulting in a programmable output power of up to 372,000 NIA. The inflatable structure supports different loop sizes, thereby providing system output powers that are far greater or smaller, depending on the requirements of each survey. Ultra compact size when deflated, resulting in optimal logistics in shipping. The direct result being reduced mobilisation costs. The ideal combination of a robust structure, with flexibility while retaining a constant shape in flight, resulting in a stable and damped receiver platform. Minimal interference from microphonic noise. Less prone to damage than a conventional rigid or semi-rigid system. All raw, streaming data is recorded. Time gates are selected post flight, thereby ensuring that the system data presentations can be tailored for all target or application requirements. Rapid setup time of only 4 hours for a complete system installation. Mobilisation costs are reduced due to the compact size of the system when deflated. The shock absorbing qualities of the frame results in a perfectly damped platform producing extremely quiet data.